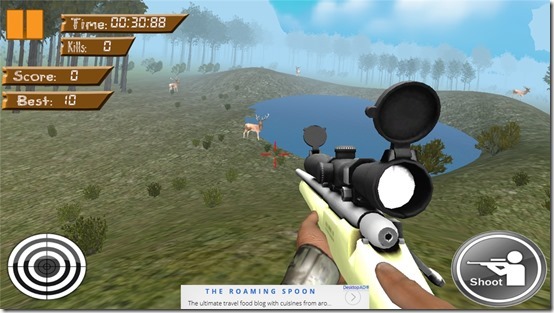 Deer Hunter Shooting 2016 is a free shooting game for Windows 8 and 8.1 devices. Its quite difficult in real world to hunt deer, but in this shooting game the only thing you have to do is hunt deer before they get away. Developed by Gillu Games, with 3D graphics and natural sound effects, this game gives you a feel of real hunter. 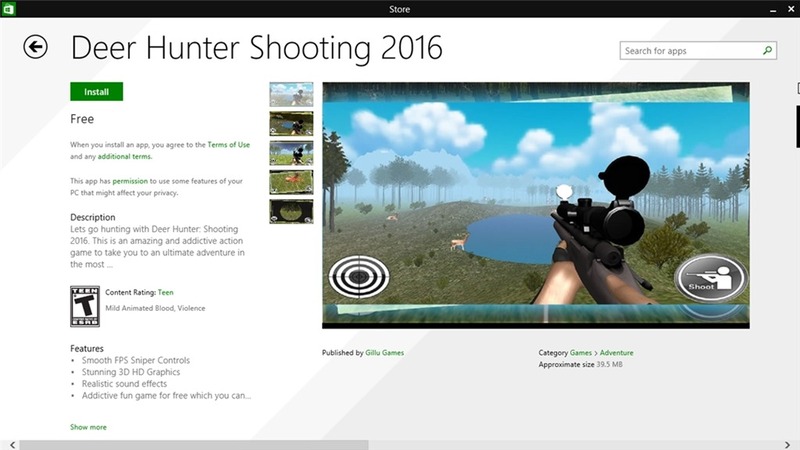 Deer hunter shooting is available for Windows 8 and 8.1 devices. You can get this game from Windows App Store. To install this shooting game for Windows, just follow these simple steps. Go to Windows App Store, search for this game by its name in the search bar. After the search is complete, an installation window will appear, click on the Install button to install the game. The game is small in size and only requires 40 MB of your disk space. The game is also available for Windows 8 based phones and tablets. This shooting game for Windows 8 is very easy to understand, and even easier to play. As the name suggests, the game is all about hunting the wild deer. The game home screen will appear when you begin the game. To start the game, click on Hunt option on game home screen. 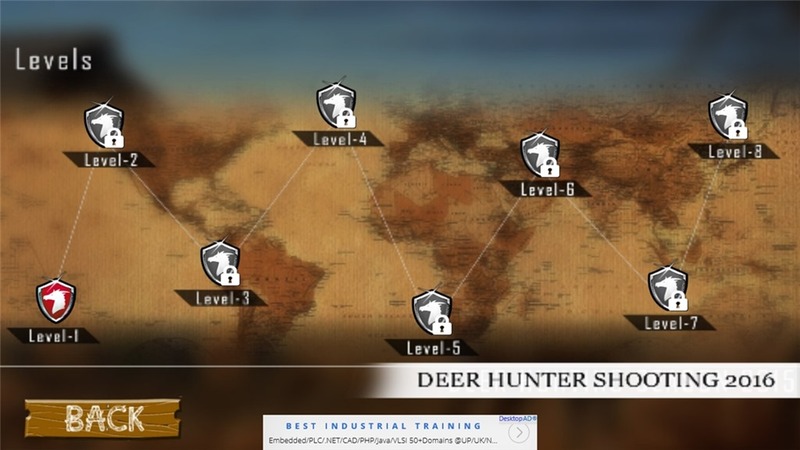 After clicking on Hunt, different levels of the game will appear. There is no difficulty level option in the game, but as the level increases the difficulty level of the game will also increase. For those who are playing the game for the first time, only first level can be accessed. You can unlock the next level on completing the first one. Now moving to the game play, you are a hunter so all you have to do is hunt deer. The scoring in the game completely depends on the completion of level. The controls of the game are very easy to understand. Move the hunter with navigation keys. Use mouse to set the view. For the rifle control you can either use mouse, or keyboard. Use right mouse button to aim, and left to fire. You can also zoom in the aim using the scroll wheel. For keyboard use ALT to zoom in the camera, and CNTRL to fire. Use R to reload and Q to change weapon. For phones and tablets the controls of this shooting game for Windows 8 are fully touch based. Click on the shoot icon on bottom right side of the screen to shoot, and use the target icon on bottom left to zoom in the camera. So hunt down deer, score well, and enjoy being a hunter. With 3D graphics and very good sound quality, this game make itself a very good download for your Windows 8 devices. Also this shooting game for Windows 8 game gives you the option to directly connect with with socialmedia with the help of share option. 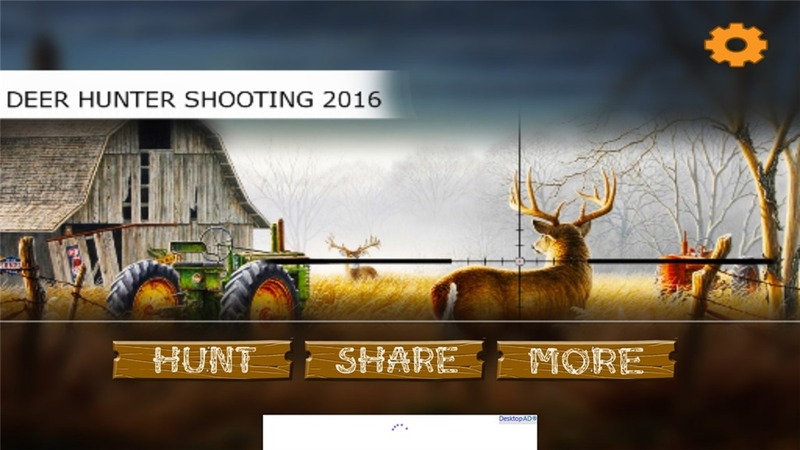 Download Deer Hunter Shooting 2016 for Windows 8 and 8.1.